mm227: Nanotechnology: The future is now — is it safe? Nanotechnology. The gee-whiz technology of our future. Tiny robotic surgeons, injected into our bloodstream, repairing damaged organs and scouring clogged arteries. “Fantastic Voyage” made real. That nanotechnology hasn’t arrived quite yet. But, The Economist, the best magazine on the planet, explored today’s nanotechnology in a recent issue, and raised some rather unsettling questions. Because, as it happens, nanotechnology has arrived in a big way, as it were, and once again, we may not be aware of its implications. 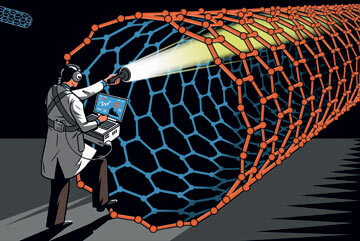 WAVING a packet of carbon nanotubes accusingly at the assembled American politicians during a hearing last month in Congress, Andrew Maynard was determined to make a point. The nanotechnology expert at the Woodrow Wilson International Centre for Scholars in Washington, DC, had bought the tiny tubes on the internet. They had arrived in the post along with a safety sheet describing them as graphite and thus requiring no special precautions beyond those needed for a nuisance dust. Dr Maynard’s theatrics were designed to draw attention to a growing concern about the safety of nanotechnology. The advice he had received was at best uncertain, and at worst breathtakingly negligent. For a start, describing carbon nanotubes as graphite was rather like describing a lump of coal as a diamond. Graphite is made of carbon, just like the nanotubes, although the tubes themselves are about 1m times smaller than the graphite that makes up the “lead” in a pencil. Carbon nanotubes may be perfectly safe, but then again, they may have asbestos-like properties. Nobody knows. Indeed, industry, regulators and governments know little about the general safety of all manner of materials that are made into fantastically small sizes. In the past few years the number of consumer products claiming to use nanotechnology has dramatically grown—to almost 600 by one count. Patents are rapidly being filed (see chart 1). For a product to count as nanotechnology, it does not need to contain a tiny machine—though some seers imagine that as the field’s ultimate aim. It is enough merely for some of the material to have been tinkered with at a small scale. Often that can involve grinding down a substance into particles that may be only a few nanometres big—a nanometre is a billionth of a metre—about 100,000th of the thickness of a sheet of paper. These particles can also be engineered into shapes that provide some functional property, like rigidity. The variety of shapes includes rings, shells, wires, beads, cages and plates. The particles and shapes can also be incorporated into other materials to bestow useful properties on them. Examples are cosmetics and sunscreens, where ground up nanoparticles of titanium oxide can block ultraviolet rays but remain transparent. Problem is, that while scaling known elements into tiny sizes can improve their functionality in tremendously useful ways, it might also increase toxicity, by making the particles much more reactive than in their normal state. Because nanoparticles can thus be more reactive, and are so infinitesimal, they could breach the body’s normal defense against invasion and perhaps accumulate to possibly toxic levels in the organs. Concerned yet? You might become more so when you learn that there is no clear consensus in industry or among government regulators regarding the amount of risk, or even whether there is risk at all, in the growing use of nanotechnology, even for those products meant to be applied to the skin of, or consumed internally by humans. Meanwhile, nanotechnology is becoming part of the global economy. It could help produce trillions of dollars of products by 2014, ranging from face creams to computer chips and car panels, according to Lux Research. The risks from these products will often be very low or non-existent. In the computer industry, for instance, making smaller and smaller features on the surface of a chip is not likely to involve much risk to computer users. Motorists probably have little to fear from carbon nanotubes being embedded into a car door to make it more crash-resistant. Yet what happens to such products at the end of their life remains a question. MUDGE is all for pushing the envelope, creating breakthroughs, reaching for Mars. But in our haste toward the future, the risks involved should be given more than lip service, or remain in the hands of organizations whose priorities are conflicted. Or else we won’t be able to blame the next health scare on China. This entry was posted on Wednesday, December 19th, 2007 at 9:40 pm and is filed under Business, Environment, Health, musings, Science, Technology. You can follow any responses to this entry through the RSS 2.0 feed. You can leave a response, or trackback from your own site. 3 Responses to mm227: Nanotechnology: The future is now — is it safe?